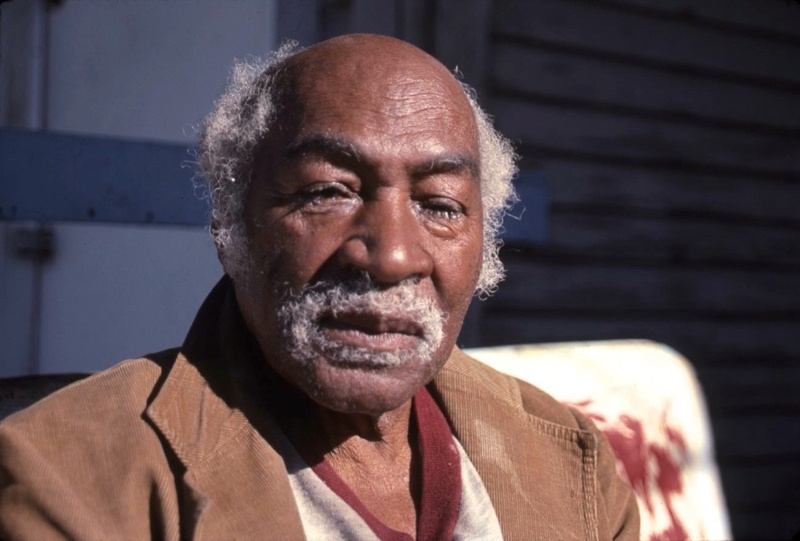 Henry Speller grew up on a plantation in a tiny Mississippi Delta community he refers to as “Pannabun,” near Rolling Fork, his birthplace. Because he cannot spell Pannabun and no one can find it on a map, it is omitted from Speller biographies. The area where Henry Speller grew up is on the map as “Panther Burn,” a few miles from the Mississippi River, a few miles from Rolling Fork, Anguilla, Nitta Yuma, and Grace, and a long way from almost anywhere else. I used to put the telegram posts down, make the cups and find the wire, put it up. I worked on the river, too, over in Vicksburg, working on the levee. Tote sacks with sand in them, two hundred pounds, on your shoulders with two sticks. Loaded cotton bales. Stand out there in that cold water sometime up to your chin, thinking, “Don’t want to drown.” Then them boats come by, wheel rolling, music, ladies, things going on. It give you some ideas to think about, forget the other stuff. 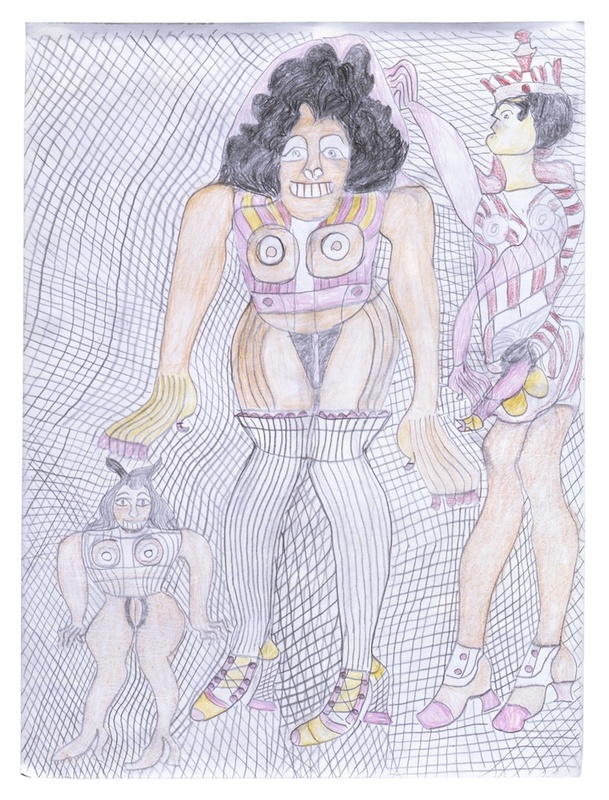 Henry Speller gives a reason for making drawings: “They just consolate me when I’m back here by myself.” Speller draws sexual fantasies, of long-haired, big-breasted women. 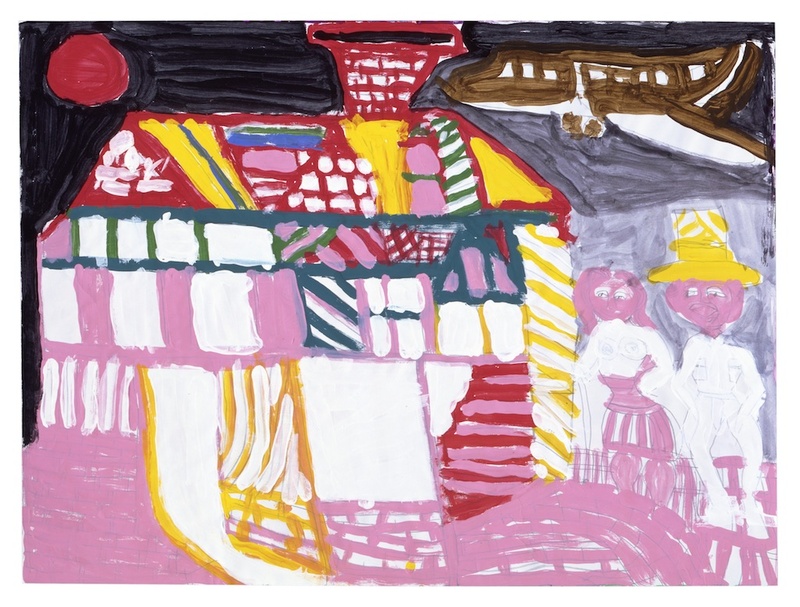 Such fantasies kept him sane and functioning when he stood in the Mississippi: and drawing them helped to “just consolate” him in the presence of the monotony and internal anger he had to deal with each day. Speller also describes his continuing fascination with the century’s changing technology, especially as it relates to transportation. Speller has watched and recorded he development of boats, trains, motorcycles, automobiles, and airplanes. As a boy, Speller sensed that an education would help him get out of the Delta. He often thought about the possibility of migration to the North. 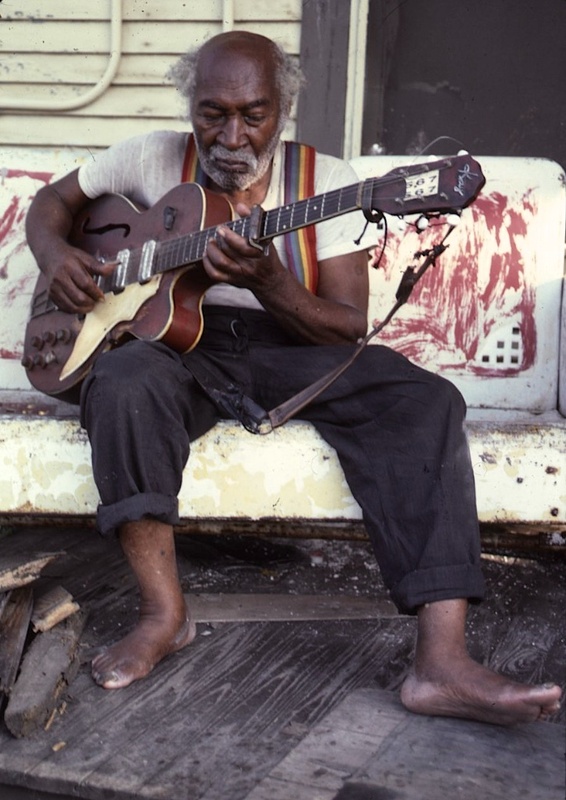 He knew about Clarksdale, heard a lot about Memphis, even saw people leave for St. Louis and Chicago. But there was never enough time for school; sharecropping required long hours of work, and the classroom was too far away. He recalls, “The doctor came one time and said to my mama, ‘That boy got a good head on him. Give him to me and I’ll put him in school.’ Mama say, ‘I can’t let you have my boy.’ Doctor say, ‘He learn to write he could make you some money.’ Mama say, ‘I can’t stand for him to go off from me like that!’” So an opportunity for education, like a Delta train or a Mississippi riverboat, came into Speller’s world, passed in front of him, and kept going while he stayed on the land. The depression came, and Speller worked on a small farm in Leland, a larger Delta town, growing cotton and corn. He had two children then, a boy and a girl, from two unsuccessful marriages, and he was caring for his grandmother, Zannie Simpson. The farm lay between Highway 61 and the Illinois Central Railroad tracks. Speller’s son, William, recalls that the train ran right by the door every day carrying passengers, and also cotton, livestock, and coal to Memphis. Cars went down the road on the other side. Daddy would take an hour every day for lunch and sit on that porch watching. He drew what he saw go by. There was a man sold candy, would leave it with Daddy, and give him a commission for selling it to his friends. That’s how Daddy got money to buy paper and pencils to do the drawing with. Passing the tall grass turning brown. Just see her smoking through that piney land. Daddy was always easy going. He never let anything get to him. The only time he let himself loose was for music. Muddy Waters, he was also from Rolling Fork and he lived over in West Memphis, in Arkansas. So did Howlin’ Wolf. Daddy would meet them on Saturday night down in Walls, Mississippi, and play with their bands. When Howlin’ Wolf moved to Chicago so he could make more money, he wanted Daddy to go play with him, but it was too cold up there for Daddy. Henry Speller and Georgia Verges [Virgil] met in the early sixties, married in 1979, and had a marriage that both described as “just about perfect.” She died in 1988. 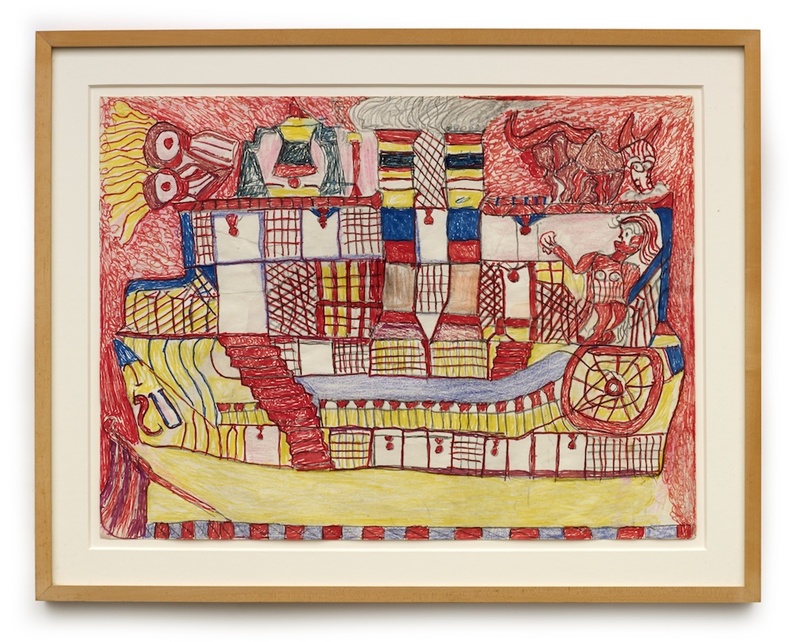 She had learned to draw as a child but became actively involved in her art only after being encouraged by her husband. It was an important element of their life together. Often, they engaged in playful yet serious competition, drawing the same subjects and comparing results. “I ain’t near as good as Henry” was her assessment. “She done come to be a whole lot better than me” was his. When I was long about eighteen, Ike Simpson_he raised me, he was married to my mama_he was working for a white man cutting some railings. White man was named Acey, tall man, wore pointed shoes, had a long old raincoat used to wear all the time. Man check on Ike, Ike told him he had the railings and told the man the number he cut. Man say, “How come you got that number; that ain’t what I got.” Ike says “’Cause I cut them and I counted them.” and the white man got mad, went off and got a mob, got a gang of them off the river; come out to kill Ike, get him out of the way. A white man had a store and liked Ike. Mr. Paul Stratton, big fat man. Told his son to go warn Ike, get him out of there. Ike got in a car with Paul Stratton’s son and they took him somewhere to a white widow lady’s place and he stayed there. Saved his life but he couldn’t come back where Mama was ‘cause they would have killed him. They used to do that all the time. Run a man away from his wife and his crops. I didn’t know where Ike was. 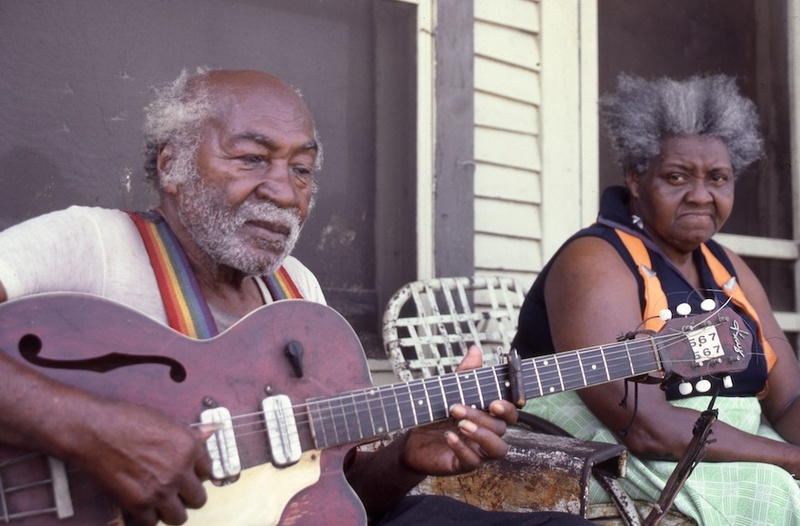 I moved to Memphis a long time later, so I got somebody to write me a letter down to Clarksdale ‘cause I knew Ike had a brother-in-law down there, and Ike had moved down to Missouri and had done married again and was farming up there. And his wife died, and his other wife, my mama, come up to Memphis, and I told her I had heard from Ike Simpson. But she couldn’t get nobody to carry her up to Missouri, so she never got to see Ike no more. He found out I was in Memphis and he written me a letter and told me to come out to Missouri and get some meat. He was raising hogs. I couldn’t get nobody to carry me up there. I decided I could make it my own self and started out, and couldn’t read no signs and couldn’t find nobody to tell me which way was Missouri except up the river, so I had to come back. Later, Ike went down to Clarksdale to stay with the man that married his sister. I went down there to see him, and he said, “Son, they ain’t treating me right. I want to come up to Memphis and live with you and die with you.” They didn’t want him to move, but he say, “Yeah, I’m going with him. I raised that boy and I’m going!” So he come up to Memphis and lived with me and died with me, and my pastor buried him. Speller tells this story without a trace of anger. He then returns to his bedroom to sit and draw. 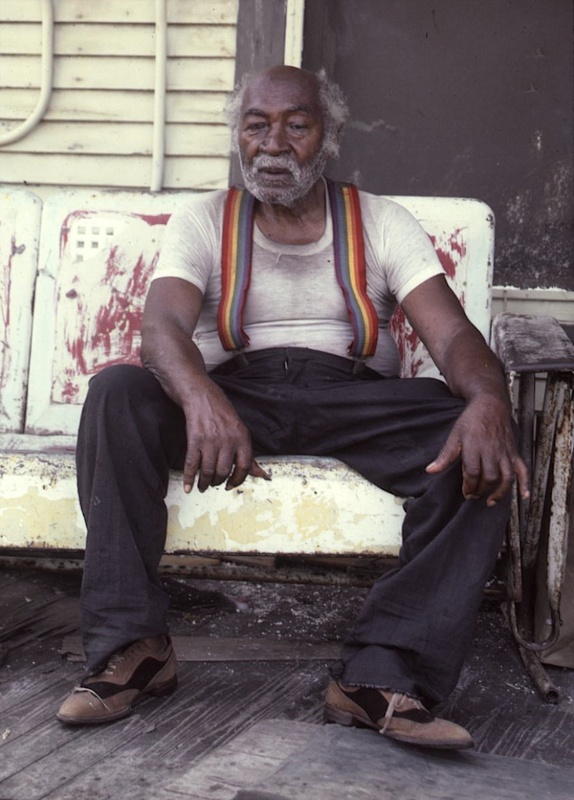 On a sticky summer night in Memphis, Henry Speller, past his ninetieth birthday, asked some friends to take him “down to Beale Street for one last time.” Though Speller lived only five minutes away from that famous gathering place, with its lively music, food and souvenirs, he had not seen it for twenty years. Once Beale Street became a tourist attraction, its distance from Speller’s ghetto increased dramatically. When Henry Speller arrived at Beale Street this night, some blues musicians were performing in the park to a crowd of several hundred. Across the street Henry Speller sat down to eat some barbecue, and he cried. He missed the old life. He missed his wife, Georgia, who had died two years earlier. He missed music. He missed barbecue and French fries. After dinner Speller (who suffered from arthritis, diabetes, and who knows what else) walked across the street—”slowly shuffled” or “inched his way” describes it better--to get close to the band. People were friendly. Couples were dancing everywhere. The crowd, mostly black, acknowledged the old man as if he were a celebrity, though none of them knew who he was. Gradually, as the music entered Speller’s pained feet, joints, soul, he started to move, to dance, very slowly. Clearly he had danced before. The crowd responded. One by one they stopped talking, stopped dancing, to watch this little old man. Speller continued his soliloquy for half an hour, and then he stopped. The crowd, which had circled around him like aficionados at a Spanish bull ring, gave him an ovation that could not have been more enthusiastic if the performer had been B. B. King or Elvis Presley. Speller cried again. “I’m done jiggling. Take me home now,” he whispered to his friends. A few yards away stood a statue of W. C. Handy. It probably enjoyed the evening as much as anyone. William Christopher Handy was born in Florence, Alabama, in 1883. Music was his life. As a child he composed and performed with a harmonica (of course) and with a comb, a broom handle, a nail (struck on a dead horse’s jawbone), and a jug. As a young man Handy traveled through the South earning a meager living as a musician with small bands. He developed a scholarly interest in the music of his own African American people, carefully listening to and documenting the sounds and words of the road. 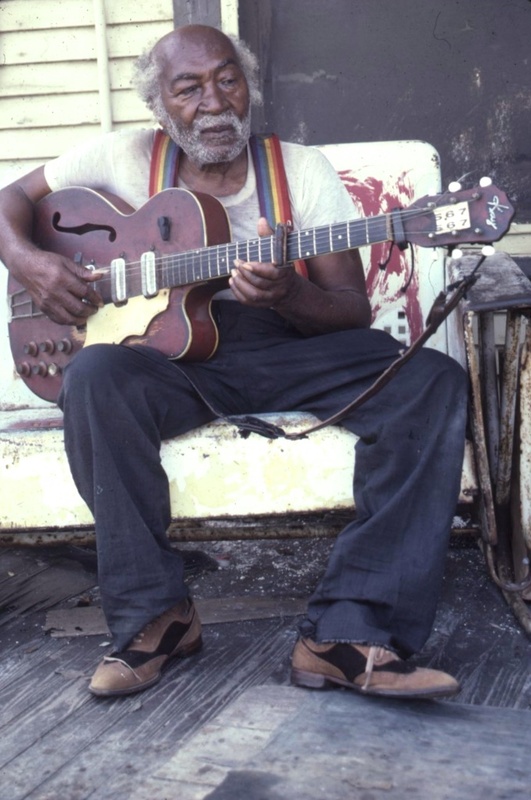 His mission was to legitimize the blues, understanding as he did its significance to African American cultural history, and the need to remove its stigma as the music of poverty and ignorance. He established a music publishing company in Memphis and was instrumental (as it were) in spreading interest in jazz and blues. Several of his own compositions, including “St. 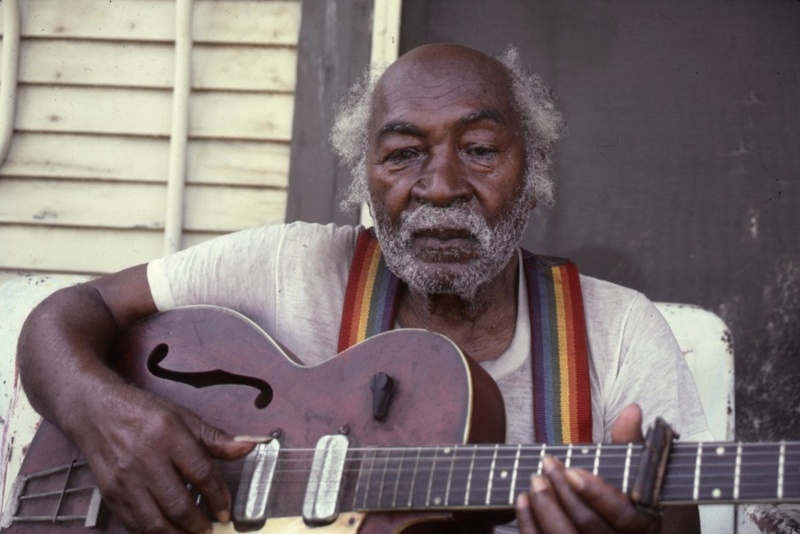 Louis Blues” and “Beale Street Blues,” are classics of American music. Henry Speller’s guitar is his diary. It contains the memories, and allows them to be conjured forth. His drawings preserve them. They are illustrated musical compositions, improvisational but ordered, structured. The instruments are there, look for them. The wavy lines, droning harmonicas. Staccato drum beats, dot dot dot. The plunk of the banjo. The vibrating, resonating guitar strings, literally drawn in. Look for William Henry Roscoe Cummingjoe Is Ready, one of the most outrageous self-portraits out there. It tells you most of what you need to know.